The first Turrican started out on the C64 computer which was popular in the 1980s. By the time the game was 75% done in the fall of 1989 it became clear that the C64 was starting to be eclipsed by the new Amiga computer in sales, so the original plan of finishing the title that was then called "Hurricane", and afterwards quickly porting it to the Amiga was abandoned. A team was formed specifically for the Amiga to look at what was playable on the C64 and start from scratch, treating Turrican as an Amiga original. 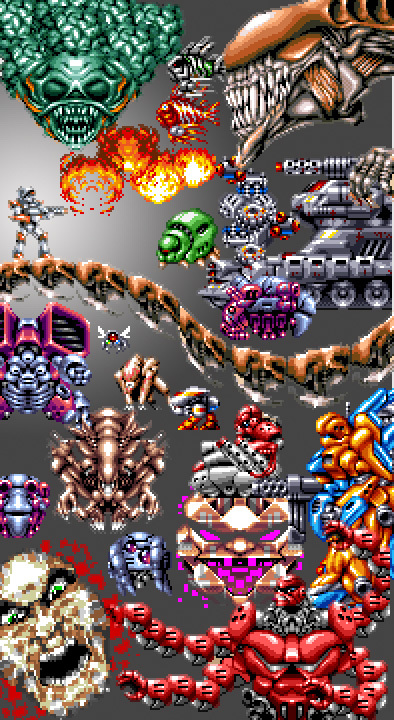 The character was re-designed (there is a screenshot of the rejected character on the back of the original German Turrican box), the controls and feeling of the game were re-built specifically to take advantage of the Amiga, it became the first game on the platform to have smooth movement of the screen in any direction, and most importantly, the Amiga offered us the audio power to finally collaborate extensively with Chris Hülsbeck, who previously had provided the memorable title track for our Amiga version of R-Type. The missing puzzle-piece was the name and after a lot of back-and-forth the marketing powers were convinced that Turrican was much more unique than Hurricane. With the success of the first game in 1990 we immediately started planning a bigger, better, and more technologically advanced sequel. For Turrican II, the Amiga would be the lead platform from the start, with the other versions trying to replicate the experience as closely as possible. In some cases, especially for the C64, designs were adapted or changed to accomodate hardware limitations without compromising quality. When Turrican II was released the spring of 1991, the reception across Europe was fantastic. Super Turrican is the first Wii Virtual Console release and was our first encounter with the world of consoles. The project was started concurrently with Mega Turrican in late 1991 but our in-house development hardware and tools took longer to engineer on the SNES side and delayed real content work until the summer of 1992. With very little time left for completion, the game was developed during the fall and winter of 1992 in one massive 3-month session of long nights in our temporary offices in a loft-apartment in Cologne, Germany. While the next two Turrican-installments tried to vary the true-and-tested formula somewhat, Super Turrican was very much in the spirit of the first two Amiga-based Turrican games. Non-Linear levels with plenty of exploration and many, many hidden bonuses and secrets. Speaking of which, any serious Turrican player of course wants to find every diamond and bonus life hiding somewhere in those levels. To help along the way, we opened up our old editing tools and have prepared maps of every level. Plus, for anyone getting stuck, there are cheat codes and fans of Chris' soundtrack can use the sound-menu code to listen without playing. On a final note about Super Turrican, if you look at the Enemy Gallery in the game manual that can be brought up by pushing the home button on the Wii-Remote, there are several nasty critters in there that you won't find in this official retail version of Super Turrican due to memory constraints. We were told to deliver the game in 4 Mbit (512 KByte), the smallest size cartridge available at the time, after finishing it as a 6 MBit title. Not only did we have to cut bits of art in several places, but also a full stage and a feature of the new Beam weapon: Not only could it freeze enemies, but also melt frozen ones, something that the player had to discover in the Ice World and that led into a stage set on a Robot Transport hurtling through the clouds. But it wouldn't fit - and thus, somewhere, on a forgotten floppy disk, there still might exist the original Super Turrican - Director's Cut. SOUND MENU: Go to options Exit, hold down L, R, X, A and press start.